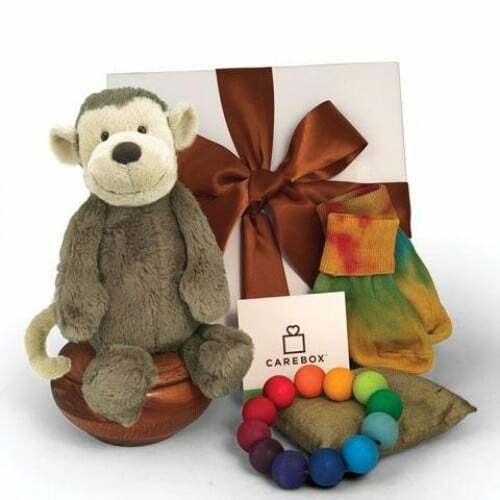 Create the ultimate safe sensory experience for your newborn with CAREBOX’s Monkey Business organic baby gift box. Looking for the perfect partner in crime for your newborn? CAREBOX has just the thing to make your infant’s holiday bright. Built with your newborn’s safety in mind, the American made Monkey Business features a furry friend that will be swinging from the branches for years to come! The seven-inch bashful monkey toy, created by famous toy company Jellycat, is made with soft, squishy, soothing brown fabric and acts as a safe best buddy your baby will love for the rest of their life. Built with your child in mind, this organic baby box is the perfect gift for kids this holiday season! This package also includes a beaded wooden grasping toy handmade from the famous German toy company, Grimm’s baby toys. This toy comes in rainbow colors and is sourced from environmentally friendly materials. As with everything included in the box, the three inch beaded ring is safe for infants up to six months of age. Finally, this product also contains organic, natural tye-dyed cuffed rainbow baby socks from Maggie’s Organics. These ultra-soft socks will keep your infant’s feet nice and warm—and looking completely adorable! All together these products create the ultimate safe sensory experience for your infant. As sensory stimulation is crucial for the development of your infant, this is not only a fun gift, but one that contributes to the growth of your infant as well. Carefully packaged in a beautiful soft ivory box and tied together with a deep chocolate soft satin bow to match Bashful by Jellycat, this is the perfect Christmas present for kids aged 0-6 months. What Makes Monkey Business the Perfect Gift for Kids? CAREBOX is a company based out of San Francisco and is built with giving products that heal and nurture in mind. Born as a means to give in a way that makes people feel good, the idea came after the creator spent time caring for her ailing parents. They are so confident that your infant will love their products, they are thoughtful enough to include a 15% off discount to be applied to your first purchase with the code “THANKYOU15.” In addition, they offer free shipping on orders of $50 or more.